The tanks in Afstan are German Army tanks, borrowed to cover the period until the refurbished tanks purchased from the Dutch are delivered. The 2A6s we’ve borrowed have the new anti-mine mods and are otherwise known as the 2A6EM. In effect, the Canadian Army is field-testing the Leo2’s latest mods for the German Army/KMW in return for a low rental fee. In the process, we can confirm which mods we wish for our soon to be delivered Leo2s from the Dutch. And there are probable maintenance benefits we are receiving from KMW. Thus the slat armour on the Leos but not the LAVs. I read about the deal to buy some Dutch tanks, but I was unaware that the Canadians were using German tanks temporarily. It actually seems to be a reasonable plan. Hey, you know how slat armor renders EFPs like RPGs less damaging. What would happen if our enemies put slat armor above their tanks? Would that weaken missiles like the hellfire? I’m assuming it makes use of the EFP concept too. What would happen if our enemies put slat armor above their tanks? 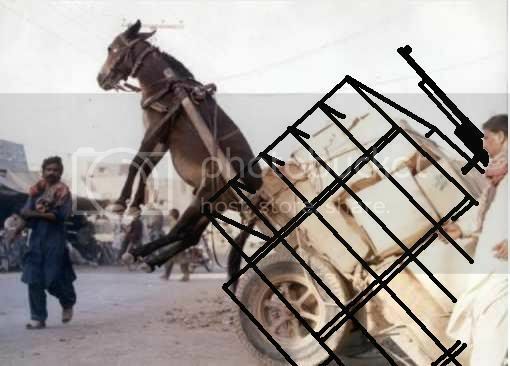 I think they’re having trouble getting the donkey to carry both cargo and slat armor. The tragic result of donkey armor.